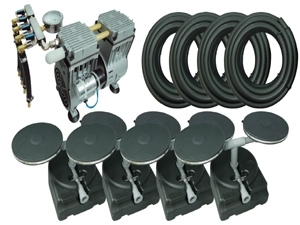 This kit is suitable to aerate a 1 acre to 4 acre lake up to 50 feet deep. It includes a (MPC200C) Matala 3/4 HP Rocking Piston Compressor with 4 way manifold , 400 feet of 3/8" Sinking Air Hose, four Air Bases with total of eight 9 inch Air Disc Diffusers. The disc base will help keep the air diffusers up out of the mud.